Feel your business could do with a tune-up, but are too busy running it to sort out the problems? With the fast, proven techniques in this book, you can transform your workplace into a powerhouse. The case studies, worksheets and practical exercises in the book help you to take the pain out of business planning and increase your profitability. You'll find out how to identify your company’s strengths and weaknesses and assess its potential. You’ll learn the secret obsessions of all the successful entrepreneurs. Robert Craven is a coach and consultant, who has helped more than 1,000 companies to flourish, showing younger businesses how to grow, and making larger businesses more nimble. He is MD of The Directors’ Centre, Visiting Professor at Toulouse Business School, and Associate Fellow of Warwick Business School. Just How Good Are You Really? The Independent. Featured in their Top Ten Business Books. 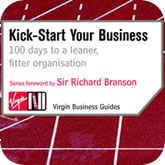 'A book that's more seriously targeted at the business community is Robert Craven's Kick-Start Your Business... It's practical and encourages you to take a look at what's happening in your company from a distance. For example, in the section on listening to pub conversations on failing businesses, Craven points to rising overheads, inability to keep the staff, customer reluctance and many other factors and says they're nonsense - businesses keep themselves in or out of the market through managerial competence, he believes.